Description: Southern had 3 GP40Xs. Total production was 23 units. 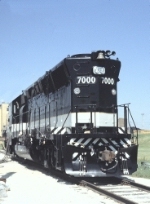 According to Wikipedia, "This unit was a pre-production version meant to test technologies later incorporated into EMD's 50-series locomotives EMD SD50 and EMD GP50."